Because kingfish have high water concentration between 50 and 74 percent, promptly gutting and brining your fish is necessary to reduce bacteria growth. For maximum flavor, and minimal risk of food poisoning, you must draw as much water as possible before smoking the meat. Soaking your gutted kingfish in a 3 percent brine solution for two to three hours reduces the number of water-based bacteria. By removing the water, the brining process also increases the protein density per ounce of kingfish meat. Your kingfish will absorb the flavor of the wood you use while smoking. But flavor isn’t the only benefit of smoking over wood. Before refrigerators were invented, smoking was the only way to preserve meat. The chemical elements inside hardwoods such as mesquite, hickory and maple, actually prevent mold, moisture and bacteria growth. Absorption of these compounds through the smoking process protects your kingfish from spoiling or rotting well after the smoking process. 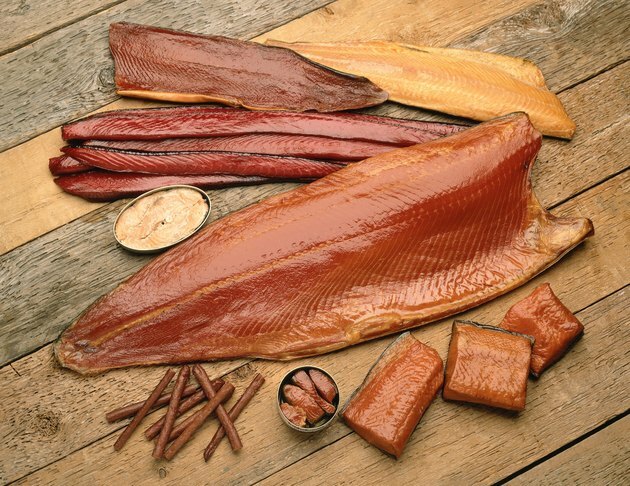 A hot smoker is best for preventing food poisoning because it smokes fish at a temperature of 140 degrees Fahrenheit. The best way to arrange your kingfish inside the smoker depends on the size and type of smoker. Whether you hang the fish or lay them flat on a rack, make sure the pieces aren’t touching each other or the sides of the smoker. Contact between the fish and another surface prevents the smoke from accessing that part of the meat, creating a kingfish slab that’s only partially smoked. Turn on the smoker and seal the smoke vent. Keeping the vent closed the entire time allows the smoke to accumulate and access the raw fish meat from multiple angles. Releasing any smoke through the vent weakens the flavor and bacteria-killing ability of the smoke. Check the fuel pan every half-hour in your hot smoker. The interior temperature must remain 140 degrees Fahrenheit at all times, which you can ensure by replacing the wood fuel or stroking the coals. Remove your fish after three to four hours.